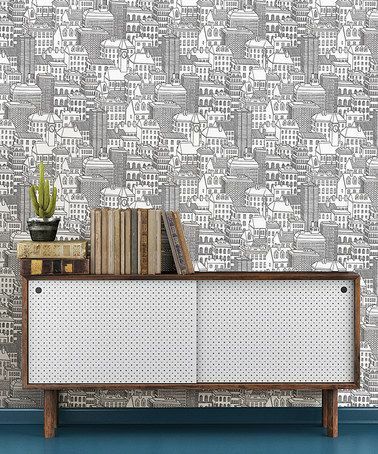 Wallpaper ... mostly used on walls, can take your furniture from low to WOW! In fact, wallpaper is one of those things, like paint, that can really help you create magic; no matter what style, age or condition of your furniture or home. If your furniture is a little on the plain side and needing more than a few layers of paint to give it a new lease of life, think about using wallpaper in some of these great creative ways. 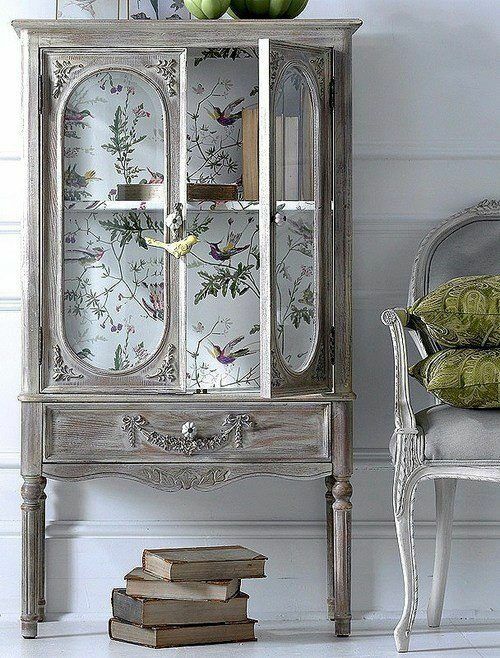 This cabinet is quickly transformed using a beautiful, traditional wallpaper with a bird theme. It works well in a room with a neutral paint color scheme, as a pattern interrupt; a bit of lighthearted interest that draws the eye. Different wallpaper designs will produce different effects. While the whimsical wallpaper pattern above is fresh and light, the wallpaper trellis pattern used on the back of the bookshelves below looks structured and formal and the perfect background for a variety of pieces. Either way, wall paper has transformed these forgotten areas and created features where none existed before. 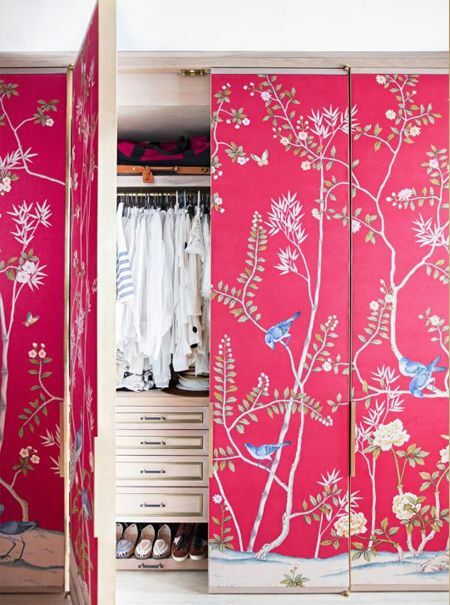 Less expensive and time consuming than wallpapering an entire room or feature wall, wallpaper has added layers of color and depth to these rooms to make them more interesting without taking over the entire space. Ever wanted to use a piece of furniture in the middle of a room as a sofa table, to discover that the back is unfinished and looks completely wrong and out of place. The problem is that most pieces are designed to go against the wall; leaving backs unpainted, unfinished and unattractive. InMyOwnStyle.com has come up with a wonderful solution, upgrading plywood board with some wall paper and then painting it to match the color of the painted furniture. 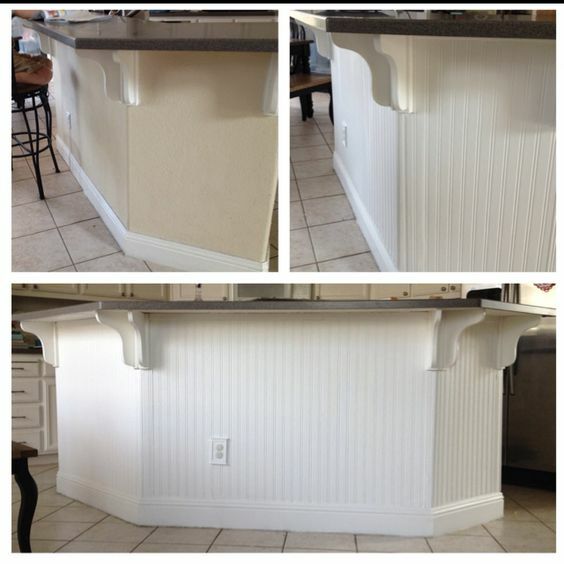 Beadboard wallpaper, used here, is a great solution for a few reasons. Firstly, its inexpensive. It is also readily available, easy to use, coming in pre-glued rolls, you need very little to cover your pieces and you can paint it, making it very versatile for so many projects (like one further down this blog post). The next step is to paint the wallpaper so it matches the rest of your piece; whether you use normal paint, chalkpaint or milkpaint, your piece will look like a perfect match. Often furniture pieces are old, tired and just a little dull; with few or no features. The challenge is to turn them into something that looks amazing; and here wallpaper comes into its own. By using textured wall paper and some paint you can truly transform your furniture pieces. The piece below from ShopNo5 was completely transformed; it was pulled apart, wallpaper was added glued to the bottom of the drawers. The whole pieces was repainted and sandpapered and metallic copper paint added to the wallpapered sections. It can take a few coats of paint to get the look you want, so be patient, especially if you are using chalkpaint or milkpaint. By the time you have completed your second coat, it should look like its coming together. Allow the paint to cure before adding wax and your final features, but you can see the textured detail below has already made a difference to this simple piece. Wax your piece with clear wax, and a darker wax if you have a dark painted piece. The effect is amazing. To get this luxurious look, add metallic paint to the embossed or textured areas. Use wax (either color) to remove the metallic paint if it looks too heavy or overdone. 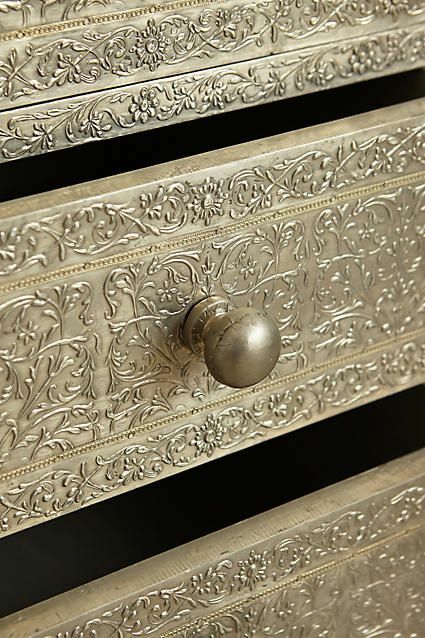 Since gray is the color of the day, here is another idea; go metallic silver all over and create an antique table look like this one below adding embossed textured wallpaper and pewter or silver knobs for detail. 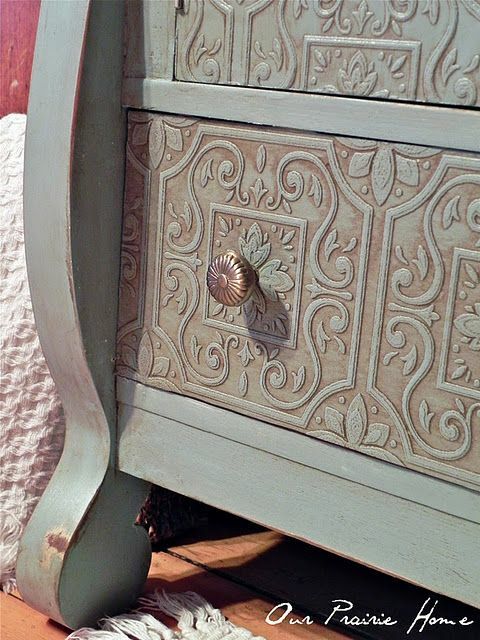 The look below highlights the embossed or textured areas with a different wax or paint color for contrast. Don't think you have to go all out! This simple piece below suddenly gains a mid century look using mid century designed geometric wallpaper on two doors. Using the same idea as above, using Beadboard wallpaper you can create features and detail where none has previously existed; like the country-chic character below for a kitchen area. 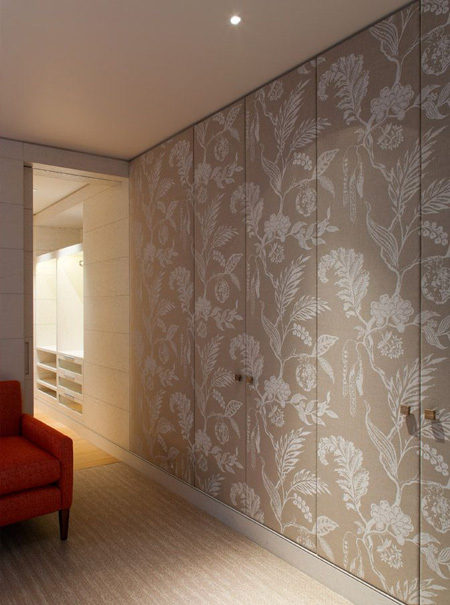 Hiding closet doors that are either low quality or have no features is easy when you use a beautiful wallpaper to create a seamless feature wall. Here are two ideas, one is bright and and floral, the one below that is subtle and understated; but both are elegant and memorable. You can use coats of ModPodge on top to protect your doors. This also helps with cleaning. I need a much lighter kitchen. It is in the middle of the house with no windows. I don't have money for expensive remodeling such as a skylight; although, I would love to be able to afford it.